Oishii-so means "looks delicious" in Japanese. This is one of what I hope will be many posts about the food I encounter living here in Japan. 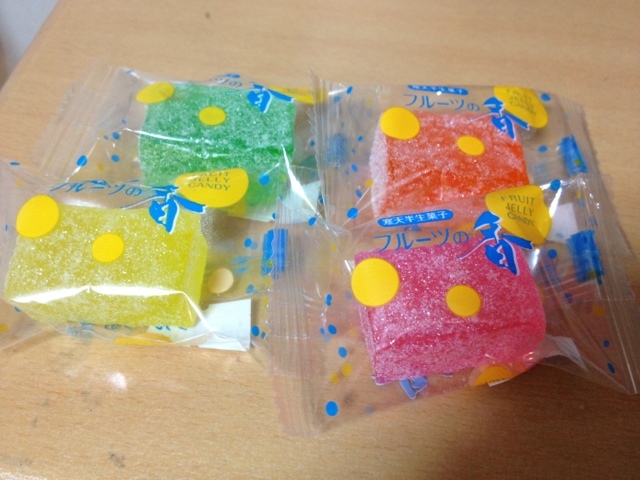 Let's start with something simple: fruit jelly candies. Sweets are an important part of the Japanese lifestyle; just look at my prior post on Valentine's Day for a small example. While the malls here are very much like the malls in America, there is one store in two of the nearby malls that is my favorite. It carries lots of toys and goodies, and resembles the kids toy stores of the 1900s and before (just with modern toys). I'll spend a whole post talking about the store, but it will be the source for many of the goodies I bring to you here. Sitting on the counter were these rectangular jelly candies that look to be similar to the Sunkist candies back I America that I love so much. At ¥21 each, they weren't terribly expensive so I grabbed one of each color to see what they taste like. First, green. The texture is gummy, different from any of the American gummies I'm familiar with. It's not terribly chewy and honestly it's not that sweet either. It has a mild apple taste and isn't too sticky. Pleasant but not the Sunkist replacement I'm looking for. Pink is a little sweeter, with a strawberry flavor. Again the texture is kind of odd, and unique. The yellow is lemon, unsurprisingly. As I eat these, I feel like I'm eating something very chalky, like Necco wafers or those Valentine's Day candy hearts, but with a somewhat gummy feel and no chewiness to them. I save the orange-flavored orange for last, hoping for some awesome explosion of citrusy goodness, but I don't get the satisfaction I expected to receive. And I realize the texture is not unlike that of a boiled potato. With, of course, the hint of fruit flavoring while chewing and the distinct aftertaste of powdered sugar. The verdict: while these aren't a bad candy, they aren't what I'm looking for. I'll pass next time I see them. What do you want me to try? What food do you want to hear about (sweet or savory)? Leave a comment! This isn't a memorial to someone or something passing away. This is just me saying I know I haven't posted in a long time but I haven't forgotten about the blog. I've made a few posts to Chaos and Kanji (linked through my profile page) but any kind of posting is still fairly difficult. I'm literally on my way right now to see about signing up for Internet (finally) so I can post more... and get back to posting about cards here. I haven't been dormant in the collecting realm as I have still been reading your posts. I met up with Kenny (Zippy Zappy) recently and have a lot to share about our adventure and I picked up several cards and collectibles over the last couple months to share with you. I finally have them all scanned or photographed so I just need a good wifi signal (home Internet service) to share them with you! So again I'm not gone and I have let's to talk about when I find time to write!